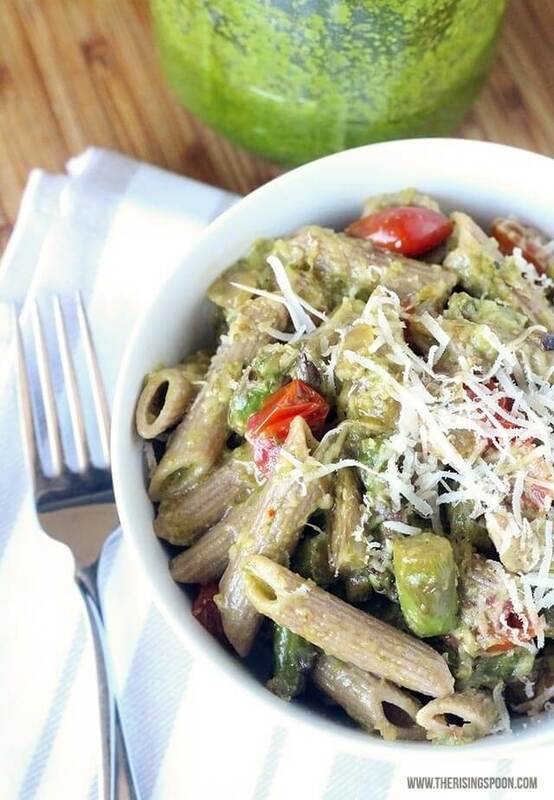 A quick and easy penne pasta recipe with tomatoes, asparagus, onion, and a creamy pesto sauce made with coconut milk. 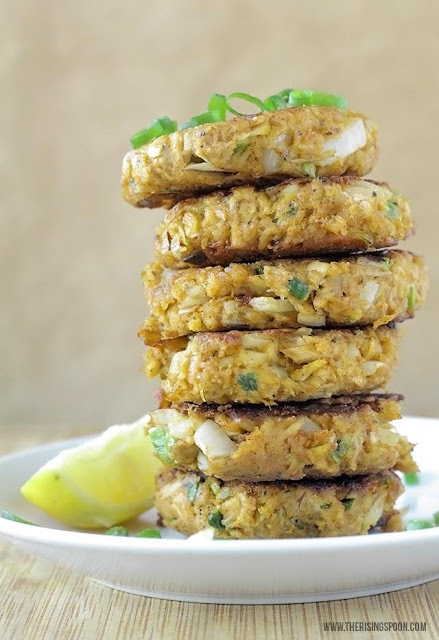 A simple vegetarian meal that's packed full of flavor! 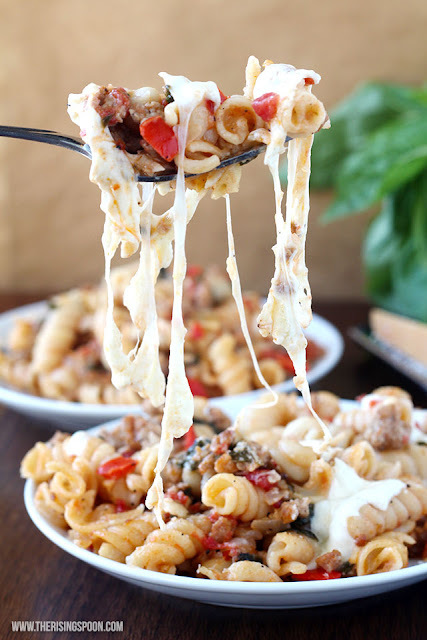 Do you have a love affair with pasta, but totally hate the carb coma afterward? I was the same way until I discovered einkorn wheat noodles! I used to fix huge bowls of saucy spaghetti back in the day with all the fixings (wine, salad, garlic bread) and always planned on changing into my pajama pants soon after the meal in order to get comfy. I always felt suuuuuuper full and tired from all that pasta. I'm sure you can relate! Well, this all changed when I picked up a box of einkorn spaghetti and gave it a try one night. Like my typical self, I ate a ginormous helping expecting to feel sleepy immediately. Instead, I felt normal. Full, but not overly full. No need to unbutton my pants or curl up in a ball. I even went back for a second helping just to prove myself wrong. That made me a bit more full, but still no carb coma. My first thought was "What the heck is so magical about this pasta?" but I quickly recovered and began hatching plans for weekly pasta dishes since I could add it back into my normal cooking rotation. How is einkorn wheat different than normal (durum) wheat? Okay, you probably want the deets about einkorn wheat, right? I'm no expert (I use my body and how it reacts to certain foods as a compass), but here's what I rustled up about some key differences when compared to modern wheat. 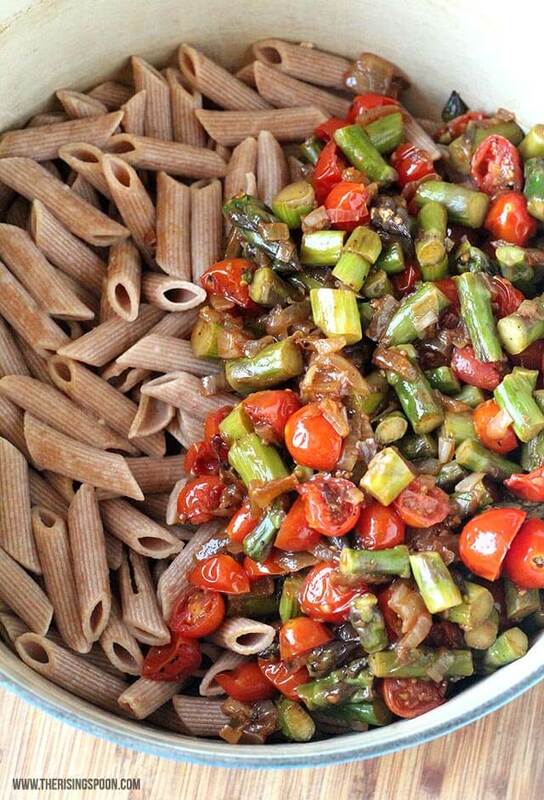 If regular ol' pasta makes you feel just fine, that's awesome--use whatever you have on hand! However, you might still enjoy the slightly nutty taste and higher protein count of einkorn noodles if you have a chance to try it. Or, maybe you're thinking "I can't have any gluten". Well, it's super easy to substitute a gluten-free penne pasta instead. 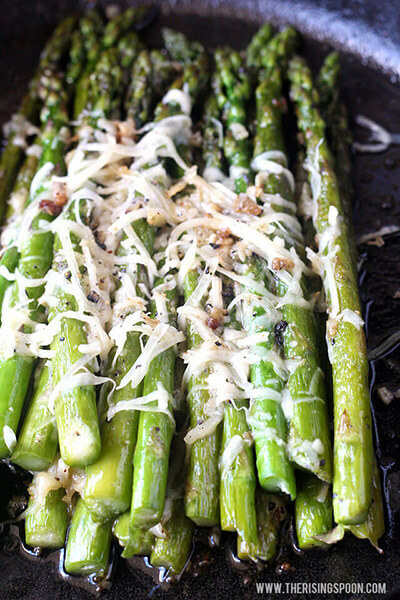 And if you're totally grain-free...zoodles or spaghetti squash would make an awesome starchy base for this dish. 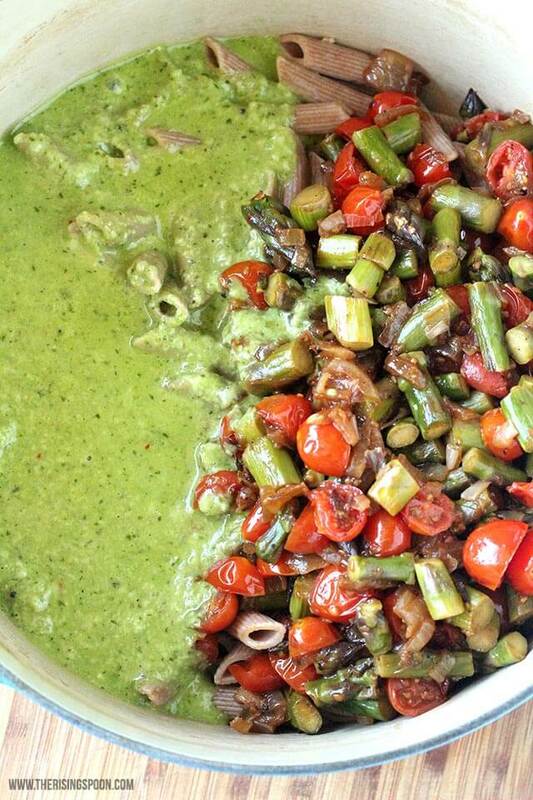 Because, really...the star of the show is this creamy pesto sauce with coconut milk in combination with tender asparagus + bursting tomatoes. Although I'm a huge fan of saucy tomato-based pasta dishes, it can take a bit of time for the seasonings to develop on the stove-top. 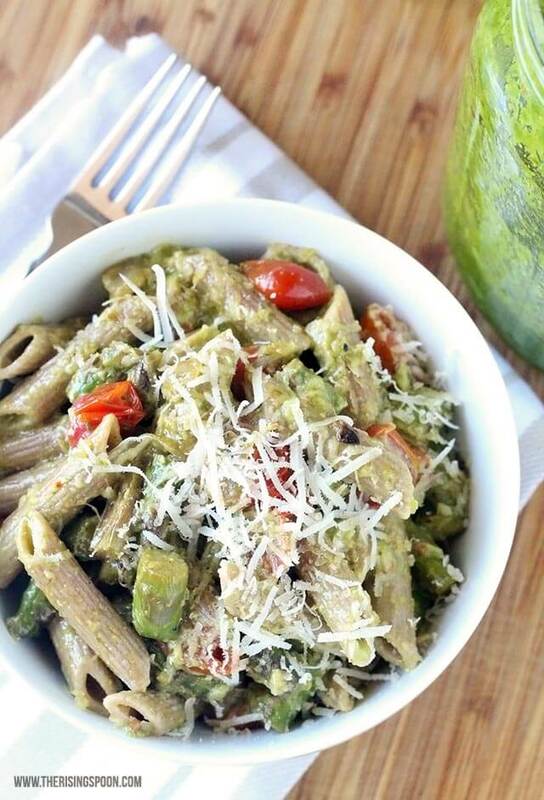 When you want something quick and fresh, homemade pesto or the jarred stuff is a lifesaver! 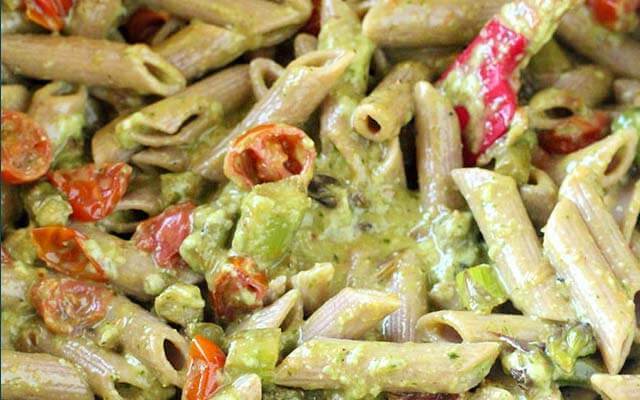 To make the pesto sauce stretch even further for covering pasta (I'm a big fan of saucy), I mix it with full-fat coconut milk, shredded cheese, and a few seasonings to form a delicious creamy pesto sauce. The best part? This sauce only takes a few minutes to come together on the stove. 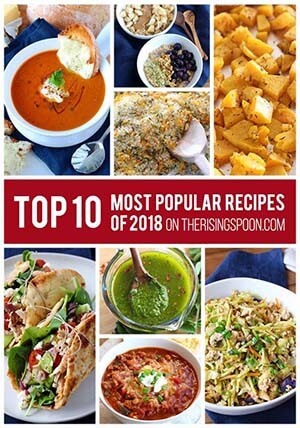 If you already have the pesto ready, all you have to do is boil the water & cook the pasta (this probably takes the longest out of everything), saute the asparagus and tomatoes (they're both quick cooking), stir together the creamy pesto sauce, and combine everything once the noodles are cooked and drained! Oh, and top everything with cheese. Then add extra to your bowl. And if you like it uber saucy, drizzle spoon extra pesto on top. I may or may not do this. Heat up a large pot of water, bring to a boil, add salt, and cook pasta according to the package's instructions. Meanwhile, chop up the onion, asparagus (I trimmed off the ends and then cut into pieces), and tomatoes. Heat a skillet to medium, add the oil or butter, followed by the onion, then cook for 5 minutes or until the onion is tender. 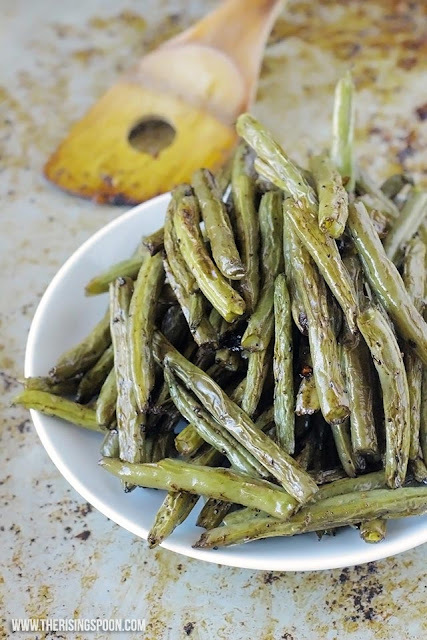 Reduce heat to medium-low, stir in the asparagus and tomatoes (put in a bit more oil if needed), cover skillet partially with a lid, and cook until the asparagus is fork tender (or your desired crispness). Season with salt and pepper to taste, and remove from heat until ready to stir into pasta. Prepare the creamy pesto sauce according to the directions in the post (it only takes a few minutes). 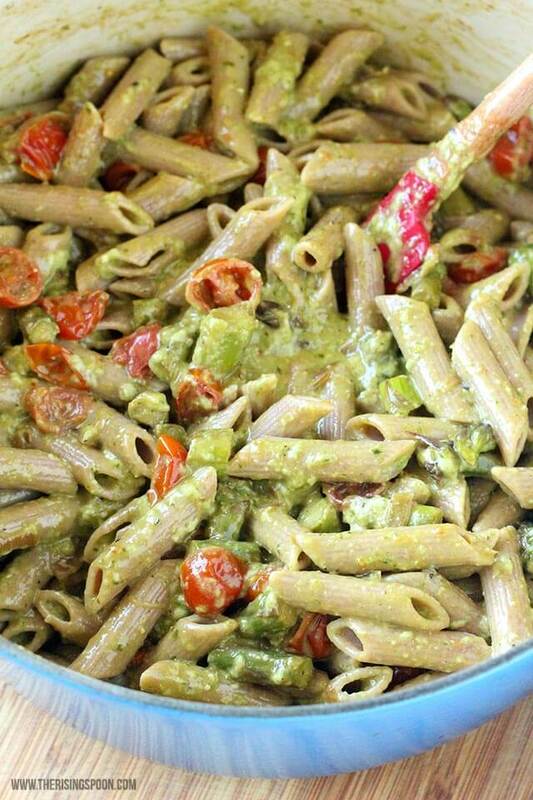 When the pasta is ready, drain off the water, place the noodles back into the same pot, and pour in the cooked veggies + pesto sauce. Stir gently, top with extra cheese (if desired) and serve immediately. • Want extra protein? Top the pasta with lemon pepper chicken, slow-cooked pork, or shrimp! • Need a bit more sauce? 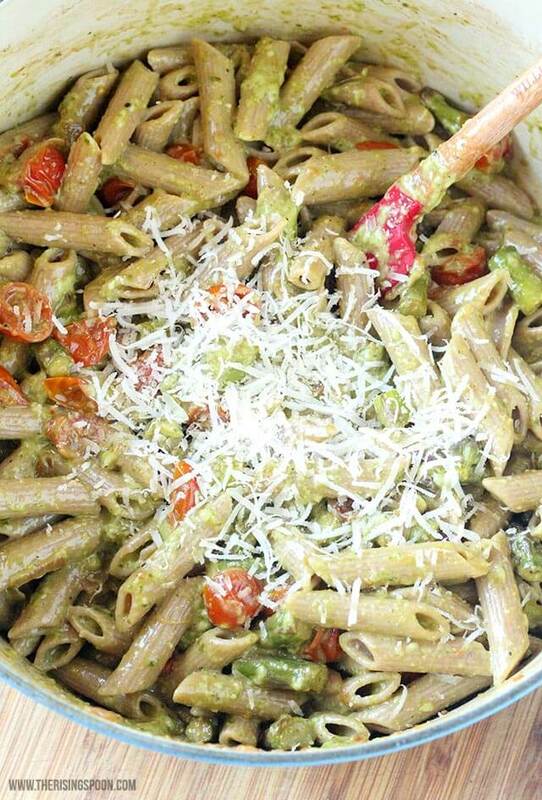 Drizzle the top of the pasta with extra pesto sauce or extra virgin olive oil. What's your favorite go-to pasta dish? Have you ever tried einkorn wheat or a gluten-free or grain-free alternative?